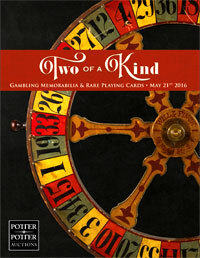 Through the generosity of Gabe and Sami Fajuri of Potter & Potter Auctions we are able to offer you free pdf downloads to all of their gambling/cheating auction catalogs and the realized prices. Looking through these catalogs will be an education in itself. In addition to the rich history of gambling through advertising and publishing you will also discover the many ways cons and cheats gained an advantage. For more information about the Chicago based auction house go to: www.potterauctions.com. 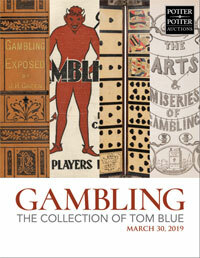 This is auction catalog #70 for the March 30, 2019 Potter & Potter's "Gambling Memorabilia: The Collection Of Tom Blue" auction. 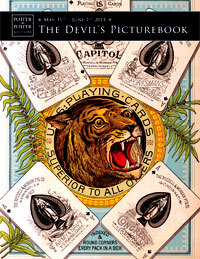 It features gambling themed books, equipment, prints cards, and advertising, many of the items are very rare, gaffed and difficult to find. Blue’s collection especially the books have always been considered one of the rarest in the field. The 134-page, 8.5"x11" catalog is in full-color and features photographs of most of the 607 lots offered for sale. Download free pdf catalog (26mg): HERE. 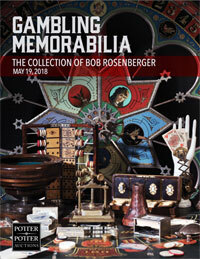 This is auction catalog #60 for the May 18, 2018 Potter & Potter's "Gambling Memorabilia: The Collection Of Bob Rosenberger" auction. It features gambling themed books, equipment, prints and advertising, many of the items are very rare, gaffed and difficult to find. Rosenberger’s collection has always been considered one of the biggest and rarest in the field. The 136-page, 8.5"x11" catalog is in full-color and features photographs of most of the 549 lots offered for sale. Download free pdf catalog (25mg): HERE. Download free pdf realized prices: HERE. Buy from Gambling Incorporated: HERE. This is auction catalog #48 for the May 6-7, 2017 Potter & Potter's " Gambling Memorabilia: Rare Playing Cards & Coin Operated Machines" auction. It features the massive collection of Bob and Rhonda Hawes and includes gambling themed books, playing cards, chips, cheating equipment, prints and advertising, game counters, markers and coin-op devices, many of the items are very rare, gaffed and difficult to find. The 200-page, 8.5"x11" catalog is in full-color and features photographs of most of the 1087 lots offered for sale. Download free pdf catalog (19mg): HERE. 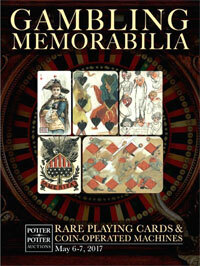 This is auction catalog #38 for the May 21, 2016 Potter & Potter's "Gambling Memorabilia & Rare Playing Cards" auction. It features part two of Ronald Wohl's lifelong collection/accumulation of gambling themed books, equipment, prints and advertising, many of the items are very rare, gaffed and difficult to find. It also includes additional gambling/cheating lots and rare playing cards. The 92-page, 8.5"x11" catalog is in full-color and features photographs of most of the 549 lots offered for sale. 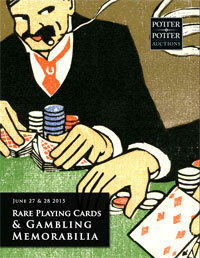 This is auction catalog #31 for the June 27-28, 2015 Potter & Potter's "Rare Playing Cards & Gambling Memorabilia" auction. It features Ronald Wohl's lifelong collection/accumulation of gambling themed books, equipment, prints and advertising, many of the items are very rare, gaffed and difficult to find. It also includes an extensive collection of rare playing cards. The 158-page, 8.5"x11" catalog is in full-color and features photographs of most of the 812 lots offered for sale. Download free pdf catalog (15mg): HERE. This is auction catalog #25 for the May 31-June 1, 2014 Potter & Potter's "The Devil's Picturebook" auction. In addition to the many gambling/cheating books and equipment it also includes an extensive collection of playing card themed ceramics. The 142-page, 8.5"x11" catalog is in full-color and features photographs of most of the 875 lots offered for sale. Download free pdf catalog (11mg): HERE. 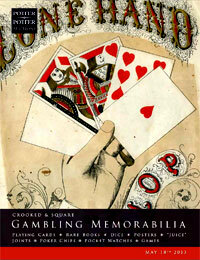 This is auction catalog #19 for the May 18, 2013 Potter & Potter's "Crooked & Square Gambling Memorabilia" auction that features rare and hard to find gambling/cheating books and equipment. The 64-page, 8.5"x11" catalog is in full-color and features photographs of most of the 266 lots offered for sale. Download free pdf catalog (6mg): HERE. 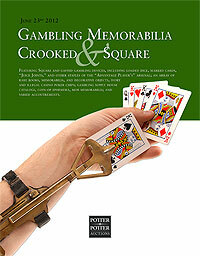 This is auction catalog #15 for the June 23, 2012 Potter & Potter's "Gambling Memorabilia Crooked & Square" auction that features rare and hard to find gambling/cheating books and equipment. The 72-page, 8.5"x11" catalog is in full-color and features photographs of most of the 349 lots offered for sale. 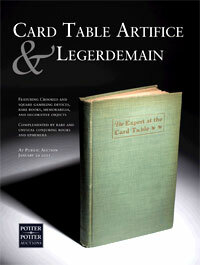 This is auction catalog #8 for the January 29, 2011 Potter & Potter's "Card Table Artifice & Legerdemain" auction that features rare and hard to find gambling/cheating books and equipment from the collections of Ray Goulet, Terry Roses and Herb Zarrow. The 66-page, 8.5"x11" catalog is in full-color and features photographs of most of the 322 (174-gambling, 148-magic) lots offered for sale. Download free pdf catalog (5mg): HERE. A Division of Gambling Incorporated. © Copyright 2005-2017 By Gambling Incorporated.